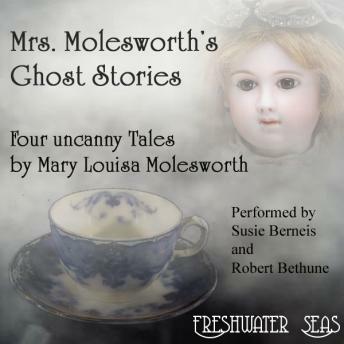 Unlike most ghost story writers, Mary Louisa Molesworth does not want to make you wake up screaming in the middle of the night. You may wake up with a shiver, but you'll also wake wake up feeling thoughtful, musing on how the mysteries of love, compassion, and memory can extend themselves into the realm of the supernatural. In "Lady Farquhar's Old Lady", she explores how women fallen on hard times never quite lose their attachment to their homes, even in death. In "Witnessed by Two", she lets us see how the deepest connections of the spirit can form a visible bridge over thousands of miles when love's need for love will not allow itself to go unspoken. In "Unexplained", she shares with us how travelers happen across an old connection to an old mystery, and it changes their lives forever, while remaining forever mysterious. And lastly, in "The Rippling Train", again she takes us on a visit into lives whose love crosses the bridge of time and distance, even if only for a moment, and even though leaving much unseen and unknown. Enjoy! A Freshwater Seas production.